And then she pulled out a little antique tin box she bought years and years and years (and years ago), mostly because she thought it was exquisite. I have vague memories of it kicking around when I was a kid, and maybe even of opening it from time to time, but the contents not ever making much sense. Well, this time they make sense. Lots and lots of sense. 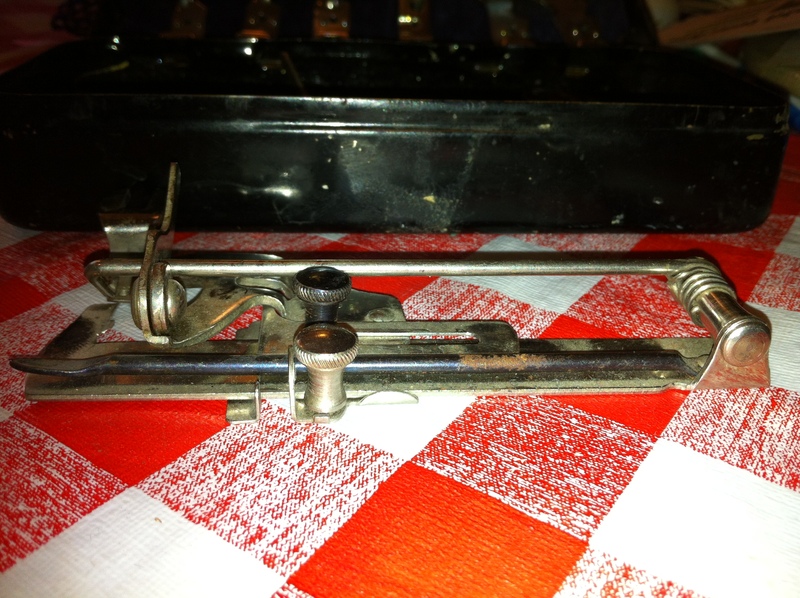 It’s a complete, exquisite set of sewing-machine attachments, for a machine with a top-clamping presser foot. Tragically (or perhaps inevitably) the feet don’t quite fit—the height is right but the distance between the clamp and the needle isn’t, and while you can fudge by not inserting them all the way, I’m not sure they’d be stable enough to actually sew with. I’ll probably try at some point, because I’m crazy like that, but I didn’t today. Have you ever seen such an insane selection of rolled hem feet? I wonder what that big ball in the middle of each is like to hem around. This is the ruffler. It’s simpler than the others I’ve seen—there’s no control for gathering on alternate stitches, so it only does ruffling, not pleats. I initially thought it might be broken, it’s so stripped down, but some wiggling and adjustment of the main screw (which controls how much of the fabric is shoved forward) and it works, although it’s badly in need of oiling and de-rusting before it goes anywhere near an actual garment. I think this is the tucker foot. 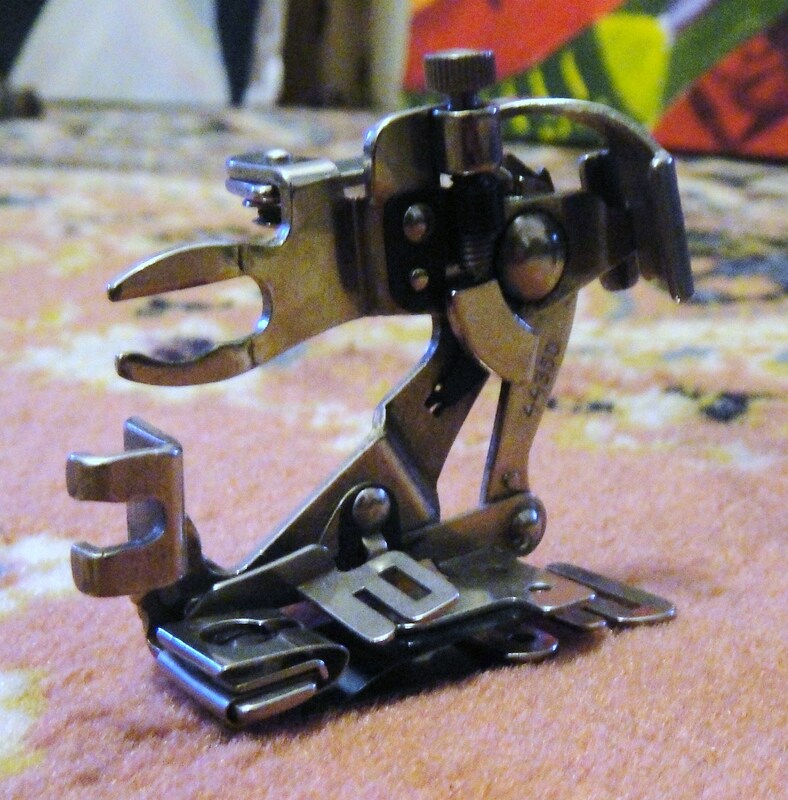 I think this based on a repro antique Sears catalogue my mom has that figures a variety of sewing machine attachments, including a similar-looking “tucker foot”, but I really haven’t got a clue how it works. And my Handbook of Sewing Machine Attachments is in a box somewhere. All the pieces bear a stamp: Pat. Oct. 13 96. Since I’m pretty sure they don’t date to 1996, that would presumably be 1896. A bit older than even my mom thought the box was, frankly. There are a couple of other random bits in the bottom, bobbins for two different machines (one I think an old shuttle treadle), a plate that would have attached to the bed of the sewing machine for lapping seams and positioning lace and ribbons and the like, and that long thin thing that I have no idea at all about. 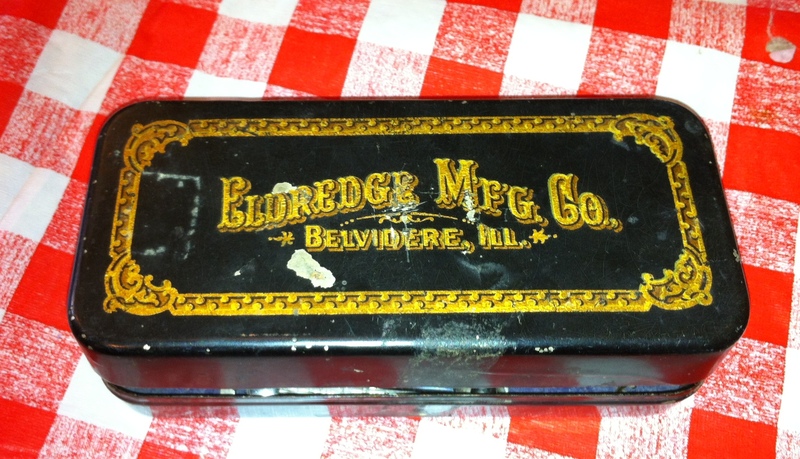 Although I didn’t recognize the name on the box, Eldredge Manufacturing Company, out of Illinois, one second’s worth of googling turned up this article about the Eldredge/National Sewing Machine company. Which, yes, was based in Belvidere, Illinois, in the period around 1896. And here’s an ad, albeit of rather older vintage, for the company’s machines. And the shuttle bobbin looks like it could well be for an Eldredge machine as well. I do kinda love the ISMACS site. Also, my messings and musings provoked my mother to comment that at this point I know rather more about sewing-machine attachments than she does. 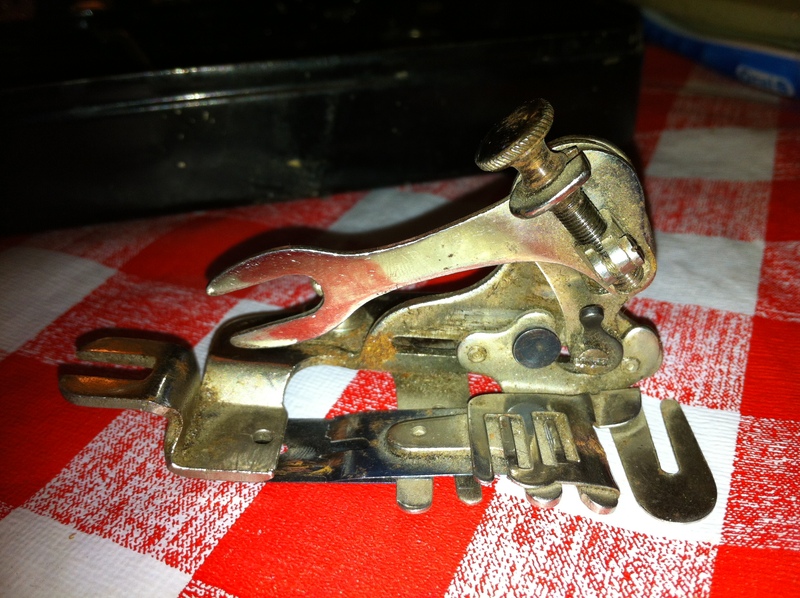 After I’d picked my jaw up off the floor, I had to demand what she was talking about—after all, it was her machine’s ruffler-foot that first got me started on this whole attachments obsession business. i SO thought you were going to say they fit. Yes. Also, apple does not fall far from tree. I always come across boxes like that in my thrifting adventures, but have never purchased any since I thought it would be pointless without the corresponding machine, but I might change my mind now. Also, 1896?! How cool is that?? 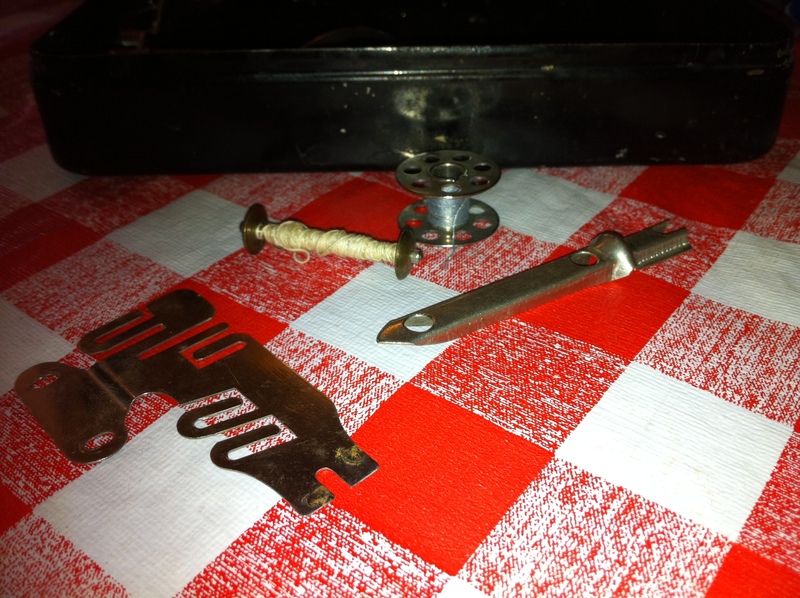 I did walk away from a buttonholer last week because it was for a slant-needle machine, which I don’t have. And it had an eyelet template. Oh man! Bummer that they didn’t fit, but what a cool box of toys! Oh. My. Goodness. It’s killing me that they are so close! I found a box of feet like that and they were just millimeters off fitting my machine, and I wanted to scream. Those are still pretty cool considering their age though. I’m impressed your mom kept them all this time! Yeah, my mom always kinda wanted her own museum… I’m pretty sure she bought them back in the 70s for pocket change. Finding a box of stuff patented in 1896 is like finding a hoard of coins where the oldest is from 1896. You know it can’t be any older than that, but it could still be newer. They didn’t change designs (patents, logos etc) so quickly then, so your goodies could date from as recently as the 1920s or so. Hard to know. Cool stuff, though – I dig that tin. Clearly the only reasonable options is to obtain the correct machine to fit the feet with all due haste. Anything else would be unthinkable! Haha, I agree with Allison! That is a pretty scary ruffler attachment, although they all are pretty scary looking imo, even my basic Elna one! 🙂 I ❤ the ISMACS site too, so much info! What fun! Plus, if they don’t fit, that’s a bit more excuse to buy a machine for which they will if you happen to run into one! You know, if we combined our powers, given all the awesome finds the sewing bloggers have had, we could probably start a museum. A functional one, at that. I still haven’t taken photos of the dress making system I inherited from my grandmother (that belonged to her grandmother). Love your army machine! Too bad those feet didn’t fit! I actually own a machine similar to the one on the drawing. I do so love these archaic looking attachments. You know how machines now have a ton of useless stitch patterns just so you feel like you are getting your money’ worth? I get the feeling that extra feet served the same purpose back in the straight-stitch-only day.I just love the sort of steam punk vibe these have? I’ve been a long time lurker and really enjoyed your blog so far, so thought it was high time I said something. I love my sewing gadgets and attachments, and love old sewing stuff, so this is a wonderful haul! I really hope you do find a matching machine at some point so you can try them out! Also, is it just me, or does the Pfaff ruffler foot bear a vague resemblance to an AT-AT walker from Star Wars? I just saw your blog…I am a little behind the times – but I own the sewing machine in the advertisement….made by Eldredge, but with the very worn badge of ” Amazon” on it. 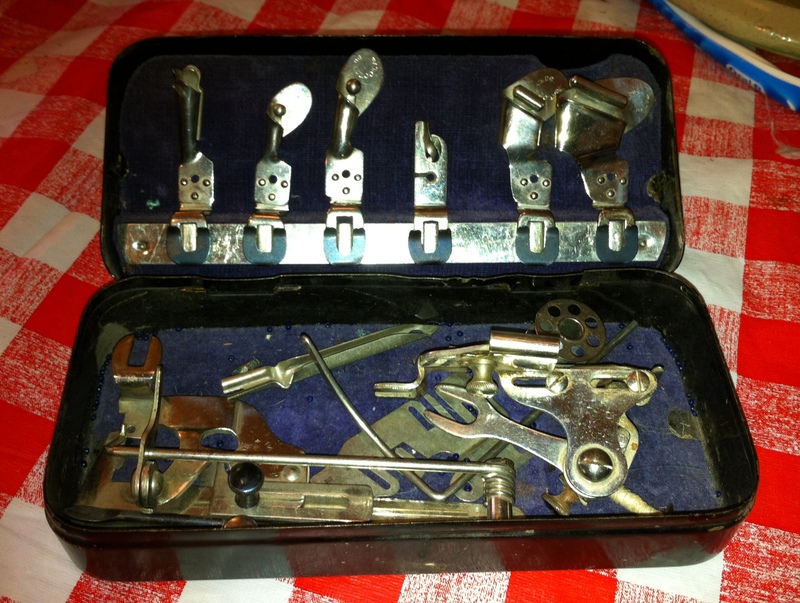 If you ever want to find a machine with the matching DNA to your little tin of attachments – please let me know. It is a fun little machine!